This May 25, 2017, file photo shows Proud Boys founder Gavin McInnes take part in an alt-right protest in New York City. The FBI has branded the Proud Boys, a far-right group of self-proclaimed "western chauvinists," as an "extremist group with ties to white nationalism," NBC News reported. The designation comes from internal law enforcement documents revealed in an internal affairs report by a Washington state sheriffs department obtained by watchdog group Property of the People. It also says a sister organization has been created called The Proud Boys' Girls. 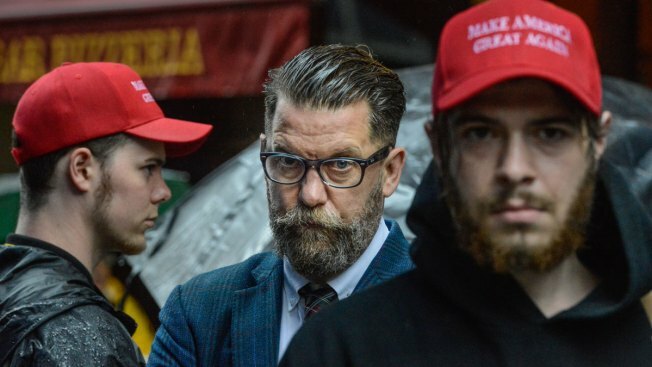 "The FBI has warned local law enforcement that the Proud Boys are actively recruiting in the Pacific Northwest and that some in the group have contributed to the escalation of violence at political rallies held on college campuses," says the July 5 report. The Proud Boys are known for their unapologetic misogyny and opposition to Muslims, as well as taking part in street brawls with anti-fascists. Founder Gavin McInnes, also a co-founder of Vice Media, did not respond to a request for comment, but the Proud Boys have denied being racist and maintain they are simply opposed to political correctness.